It was a power struggle. Who was the most powerful man in their world? Pope Leo III? Or Charlemagne? The Pope, to keep his position as head of the world, said he would crown Charlemagne emperor. Charlemagne, believing himself to be the head of the world, said no way. Charlemagne was tall, maybe as tall as 6’5”, surprising since his father was Pepin the Short. Also surprising was his voice. It was high and soft. Charlemagne was an enigma in many ways. He wore ordinary clothing, despising the trappings of his position – robes and crowns. He learned to read and write, unheard of for kings. He refused to use any of his eleven daughters to make arranged marriages to enhance his military alliances. He let them do as they pleased, which was scandalous. 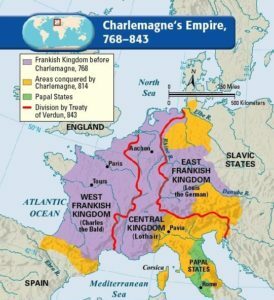 Charlemagne and his brother inherited the kingdom from their father, divided between them. When Charlemagne’s brother was killed in battle, some questioned if Charlemagne was somehow involved. Now in power alone, glorying in his position, Charlemagne spent the rest of his life at war, brilliantly expanding his kingdom. His one defeat is still talked about: the Battle of Roncevaux Pass, in the Pyrenees between Spain and France. On Aug. 15, 778, while his main army fled north to safety through the pass, the famed rearguard, 20,000 men commanded by Charlemagne’s beloved nephew, Roland, held off 300,000 Saracens. The best and the bravest, the rearguard, were cut down to the last man. The tale was told and retold in bloody, gory detail until it finally was written down as La Chanson de Roland, a 4,000 line poem and the first major work of French literature. It appeared in many written versions, the earliest of which, the Oxford Manuscript, was created sometime between 1140 and 1170. 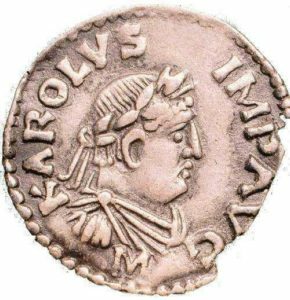 In the fall of 813, not feeling well, Charlemagne named a successor – Louis, his only surviving legitimate son. He spent that autumn hunting. He died of pleurisy in the 47th year of his reign. Pope Leo III outlived him by two years. So who won, the pope or the emperor? Pope Leo invited Charlemagne to attend Mass in Rome on the first day of 800. Charlemagne accepted. 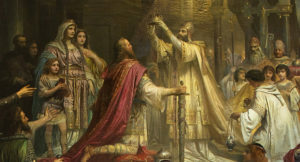 When Charlemagne knelt to pray, Pope Leo rushed up and plopped a crown on Charlemagne’s bowed head! The Pope crowned the Holy Roman Emperor.